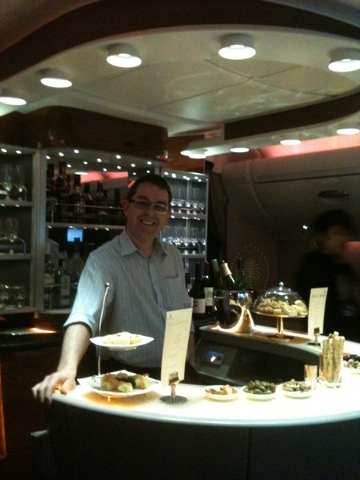 This is the passenger bar at the back of business class at the upper deck of the Emirates Airbus A380. Its amazing, as well as the usual selection of drinks cocktails nibbles they have a hot snacks menu, as my son said, its a pub at the back of the plane. The stewardess suggested she take my photo. This really is an excellent aircraft, and the staff are always great.